If you’ve been waitlisted by colleges in your area, you might want to consider going out of state for nursing school. Here at Xavier University, we’re seeing more and more students willing to move halfway across the country to attend our 16-month ABSN program in Cincinnati, Ohio — and you’re about to get relocation advice from two of them. In 2018, we had 209 students enroll in our second-degree ABSN program. Of those students, more than 50 of them relocated to Cincinnati from states such as California, Oregon, Kentucky, Michigan, and Texas. Q: Why did you move for nursing school? A: I wanted to get into an ABSN program that would allow me to dive into the nursing profession as fast as possible. When researching programs, I discovered they all have different prerequisite course requirements. Xavier only has four, some of which I had already completed through my previous psychology degree. Q: How did you start the relocation process? A: I joined the private Facebook group for Xavier ABSN students and found a girl in Ohio who was in search of a roommate. She was able to do a lot of the groundwork in finding our apartment, so the only trip I had to make to Cincinnati was the one where I packed up my car and moved. Q: What neighborhood do you live in? A: I live in Hyde Park, which is eight minutes away from the ABSN Learning Center by car. I liked living closer to where we did labs than clinicals because we spent more days per week at the learning center. Plus, my apartment is close to great places to eat and shop. Q: What do you think about Cincinnati? A: I love it so far. The cost of living in Cincinnati is so much cheaper than what I’m used to. Plus, the traffic here isn’t bad. I can get to wherever I need to go in about 10 minutes. I’m also impressed by how saturated Cincinnati is with medical facilities, giving me access to well-rounded clinical experiences. Q: Where do you like to go to have fun? A: Cincinnati is a really cute city with a lot of charming architecture and greenery. The Rhinegeist Brewery in the Over-the-Rhine neighborhood has a really cool rooftop. Washington Park, also in Over-the-Rhine, is really pretty with its music hall. Q: Do you think you’ll stay in Cincinnati? A: It’s a neat city and it would be pretty convenient for me to stick around and enjoy the low cost of living while paying off my loans. Plus, the number of hospitals in the area is another draw for staying in Cincinnati. Q: What prompted you to relocate for your nursing education? A: I wanted to go to a school where I could focus on my studies without distractions. I also found the opportunity to have clinical rotations at Cincinnati Children’s Hospital to be a big bonus. I opted to move back to New York after graduation because all of my family is there. Q: Where did you live in Cincinnati? A: I lived at the Fernview Estates, located in the Pleasant Ridge area of Cincinnati. I chose this location because it was close to highway I-71, and all of the hospitals are within a 30-minute drive. Plus, both the main Xavier campus and the ABSN Learning Center are within 15 minutes of the apartment complex. Overall, it’s a quiet neighborhood, with great local restaurants nearby. Q: Cincinnati is very different from NYC. How did you adjust to your new environment? A: I adjusted to living in Cincinnati by bringing photos of home with me, exercising, and making friends. Q: What did you like most about Cincinnati? A: The people. The people are very friendly in Cincinnati. I also liked that Kentucky is just across the river. I am a bourbon collector, and the area has some good bourbons that are reasonably priced. Q: What were some of your favorite places to go in Cincinnati? A: One of my favorite places to go was 16-Bit, which is a bar with classic arcade games. I also liked Quatman Café for its burgers and Madtree Brewery for hanging out with friends. Q: What advice do you have for others who are considering relocating to Cincinnati? A: It’s going to be hard in the beginning, but you’ll adjust. It also helps to have friends in the program who are in a similar situation as you. While you need to stay focused on the program, it’s important to carve out an hour each day to relax and try not to think about school. Q: What did you consider to be the most challenging part of the relocation process? A: For me, leaving my loved ones was the most challenging part of the relocation process. I just had to keep reminding myself that it was a short-term move. After getting accepted into our ABSN program, join our private Facebook group to see if other students in your cohort are relocating to Cincinnati and in search of a roommate. We also have a database of incoming ABSN students looking for roommates, so be sure to ask your admission counselor about it. Ready to Make a Smart Move? 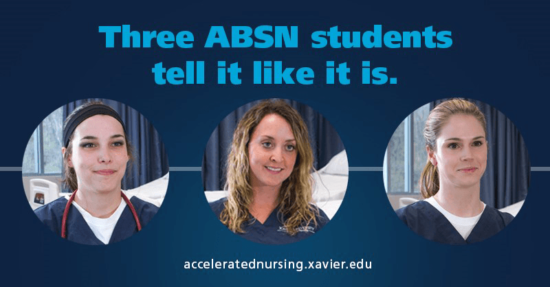 If you have a non-nursing bachelor’s degree and are being waitlisted by the accelerated nursing programs in your area, you should definitely consider our 16-month ABSN program in Cincinnati. Got questions about going out of state for nursing school? Feel free to contact our admissions team and be sure to ask for a free copy of our Cincinnati relocation guide.